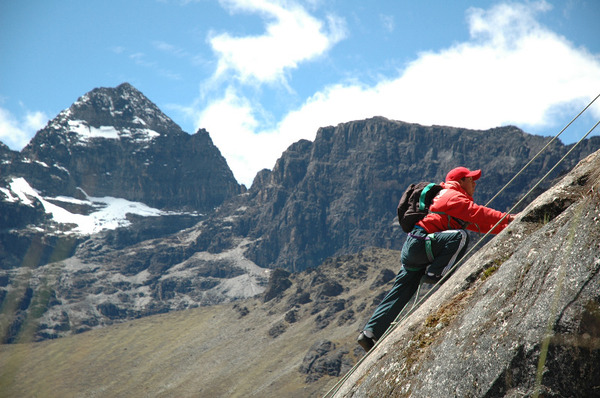 You can enjoy the climbing routes equipped in front of the refuge or a beautiful hike to Laguna Tres Picos. Nothing like an acclimatization smoothly! We continue our trek to the village of Tuni where another encounter awaits us, the community of Tuni. 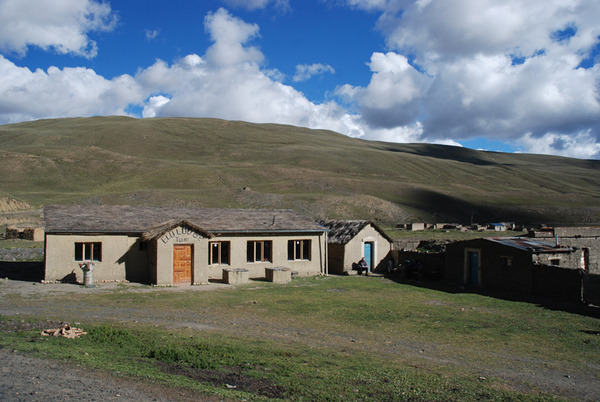 Tuni is a small Aymara village of the Cordillera, at about about 4300 m. altitude. It's a united community, proud of his Aymara culture, healthy ambitions, with which has established a real relationship of trust. 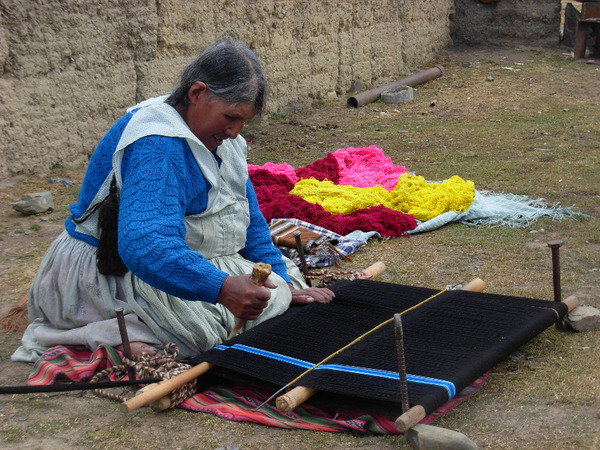 The village is at 3 hours from La Paz, located between Lake Titicaca and one of the most imposing mountains of the Cordillera: the Condoriri. It's not only to seasoned trekkers but also to a wider audience, even family. 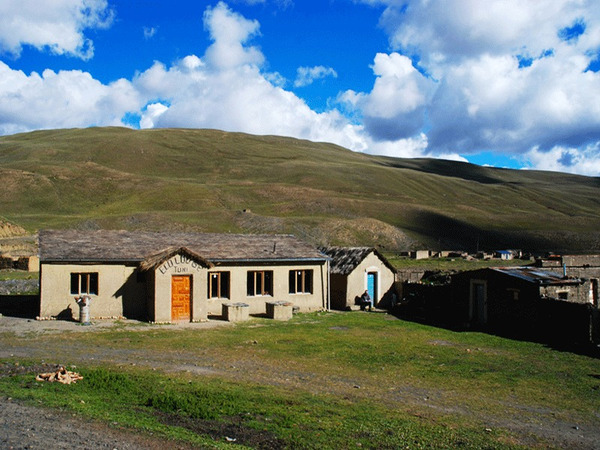 The residents of this small community (50 people), invite us to discover their daily lives in the heart of the Cordillera, punctuated by the "pastoreo" of llamas, harvesting of medicinal plants, legends of all the surrounding peaks, traditional cooking, working in mines, etc. 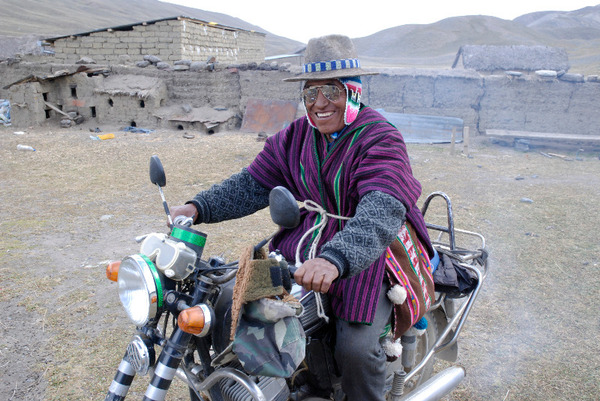 Thanks to long years of friendship with members of the community (some of them are guides, mule drivers or cookers on our treks since the creation of the agency) this project aims to support Tuni community in the valuation of the traditional Andean culture, through the real practice of a responsible tourism. Transfer La Paz- Refuge Santos. Departure from the hotel at 07:00a.m. for a 4WD trip to the Royal Cordillera (5/6-hour drive) and the laguna Kothia. We will pass the Mollo Saddle (el. 5000 m.a.s.l.) at the base of the Wila Lluxita Glacier (el. 52444 m.a.s.l.) before descending towards the Mina Fabulosa and reach the Chiqapa Jawira Valley and the Santos hut. The community of Uma Palca built this beautiful stone shelter in this superb valley. They have also bolted some climbing routes on impressive granite blocks over the valley right across form the shelter. 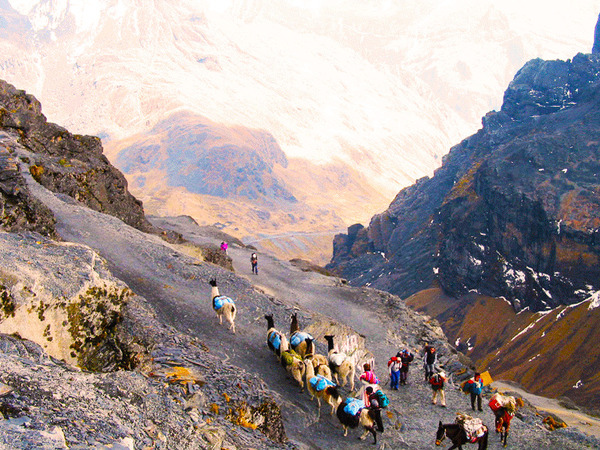 Difficulty: trek at high elevation with many passes over 5000 meters of altitude (at least one saddle a day). From 6 to 8 hours walk a day. Good fitness required. Leaving from the mountain shelter we will gradually climb the valley by an easy and partly paved track. After a saddle at el. 5050 m.a.s.l. 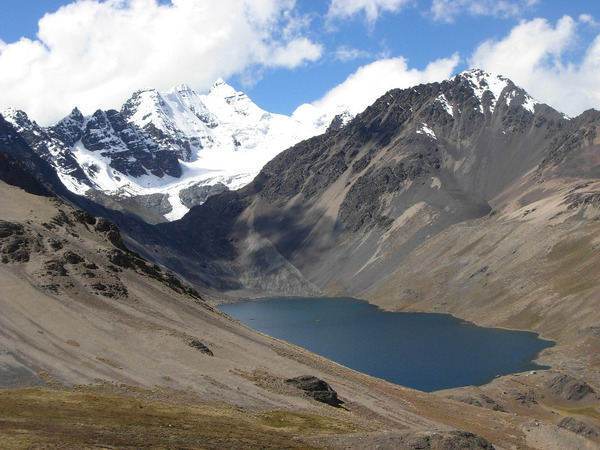 (2½-hour climb) we will join another valley via a steep section, leading to Mina Palcoco and the laguna Alka Quta. 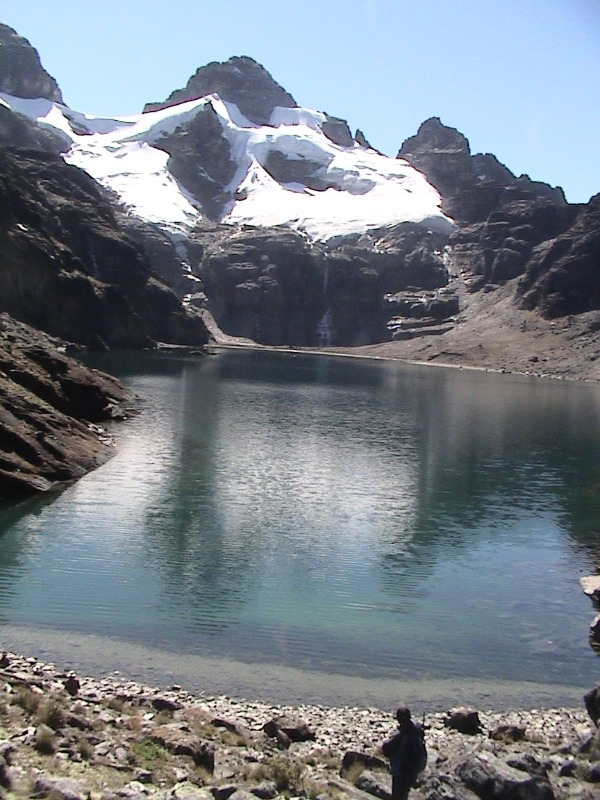 We will then reach the laguna Alka Quta in about 2 hours before continuing to the laguna Ajwani (2 more hours). Cold lunch. All included. Bivouac. A full day of rock climbing with a mountain guide. Many climbing routes are equipped right across from the shelter. The routes are all bolted with all levels (5 to 7 French grades / 5.6 to 5.12 US grades). There is also a bouldering area nearby. Cold lunch. All included. 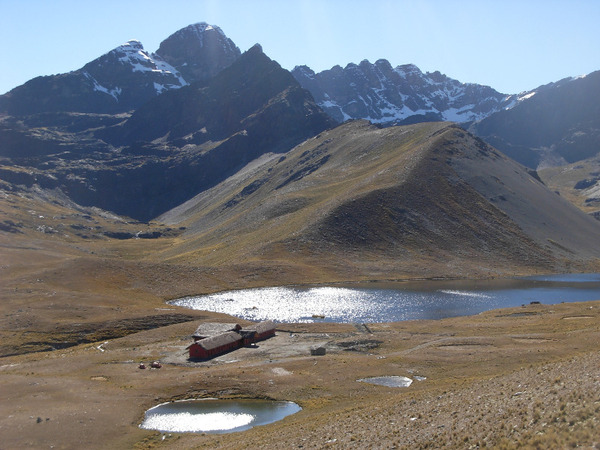 We will start following the mountain to a first saddle at an altitude of 4920 meters (Paso Milluni / 1h45), and to the laguna Sistaña (el. 4660 m.a.s.l. 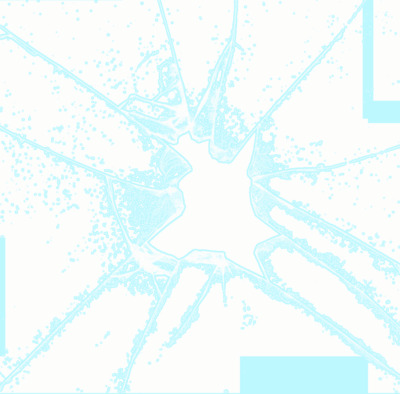 / 45mn). We will climb to a second saddle in the afternoon (Paso Janchallani, el. 4900 m.a.s.l. / 1h30), before the last descent of the day to the Laguna Jurikhota (el. 4700 m.a.s.l. / 1h). Difficulty: 5 to 6- hour hiking. Good fitness required. After getting the river bellow the shelter we will start the climb towards the Wilallojje Valley across from the shelter. Going left on a steep tracks in rocks boulders we will reach a saddle at 4740 m.a.s.l. after another hour. Beautiful view over the laguna Tres Picos or the Kunuijitinta (signifying snow avalanche in Aymara) at the base of the Tres picos glacier. We will continue on a flatter track to this beautiful laguna where we can stop for lunch. 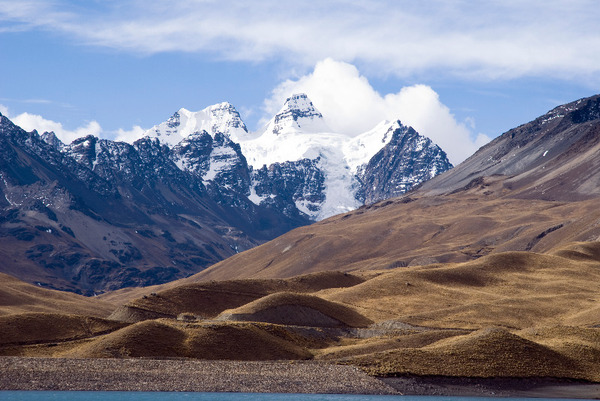 The track will then go downhill for an hour to the laguna Khota Pata. There we can try to catch some trout. Return to the mountain hut in 2 hours from the laguna. 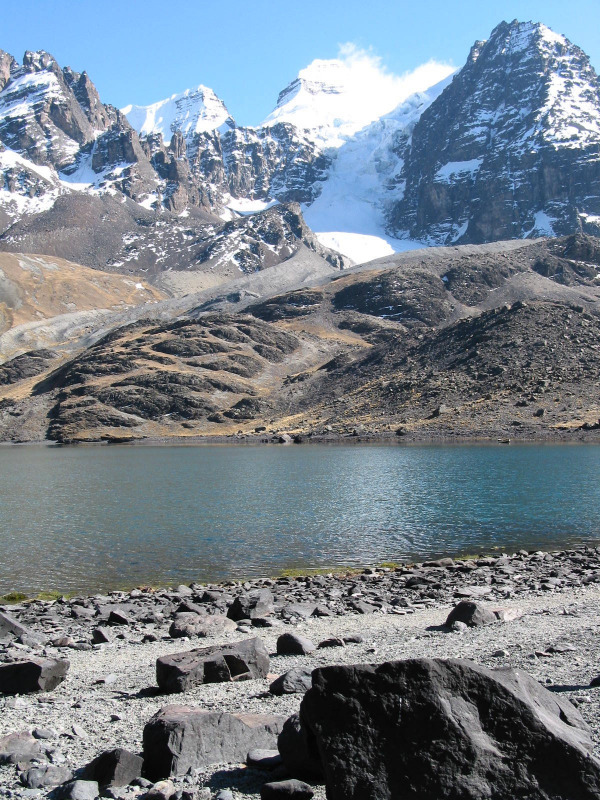 From the Laguna Jurikhota we will take a steep track to the Laguna Congelada, (with two glaciers dropping into its icy waters), a wonder at an altitude of 4900 meters at the foot of El Condoriri (el. 5650 m.a.s.l.). From there we will keep climbing to a second saddle (Paso Austria, 5120 m.a.s.l. / one hour ascent) before descending on the other side towards El Condoriri and the El Pequeño Alpamayo base camp near the Laguna Chiarkhota (el. 4670 m.a.s.l. / 1h30 descent). Leaving the Condoriri behind us we will walk on the Aguilla Negra (Black Needle) to the Jallayko saddle (el. 5025 m.a.sl.). Before climbing up the Tillipata saddle we will walk through the beautiful valley of Jistana (where we can admire a myriad of lakes). 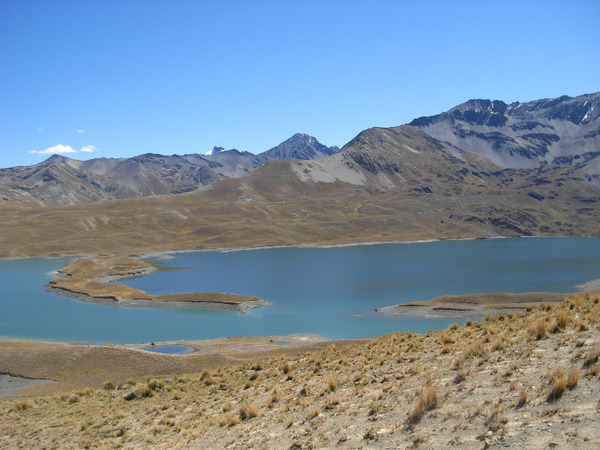 We will then descend to the Laguna Wichu Khota, at the foot of the María Lloco (el. 5522 m.a.s.l.) and continue to the the community of Tuni. Cold lunch. All included. Night in a community Eco Lodge. 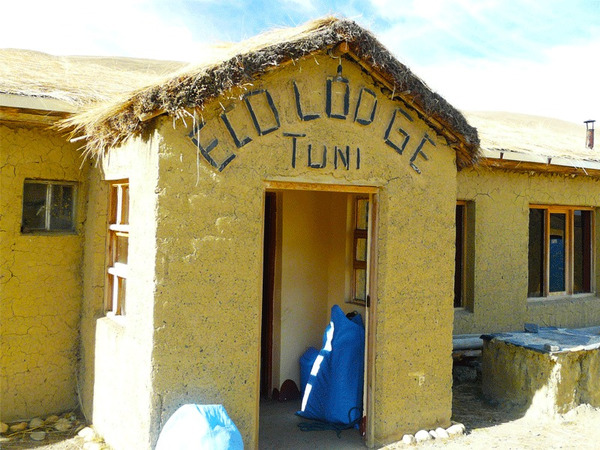 Night at the Ecolodge Tuni hotel**. 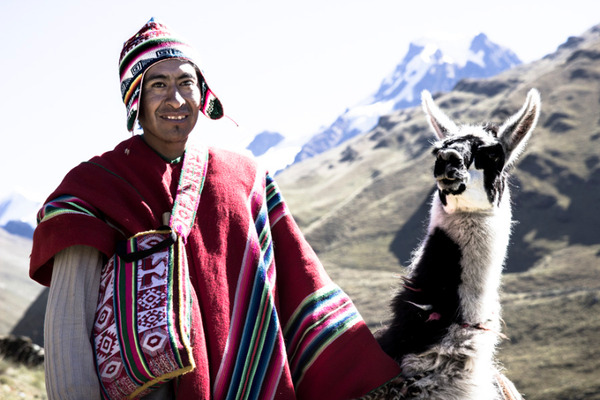 After a traditional breakfast with buñelos (types of fritters) and api (tasty hot drinks made with purple corn), we will accompany the llamas and the alpagas to their pastures. We will then help to the traditional preparation of the huatia (stone ovens built under ground) to cook the lunch (depending of the number of people). We will go for a few hours walk in the afternoon in the Condoriri range with the guide showing us the medicine plants used by the aymaras. Option to visit a tin mine under exploitation, at more than 4500m of elevation (depending of the fitness conditions of the participants and the time available). 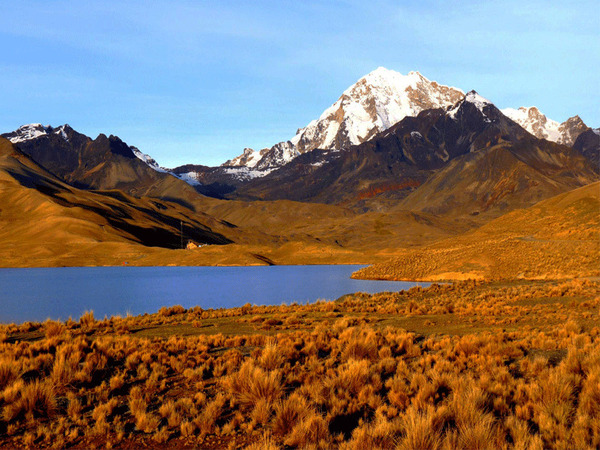 We can admire the Condoririr, the mythical summit of the Cordillera Real with the shape of a condor with tucked wings. 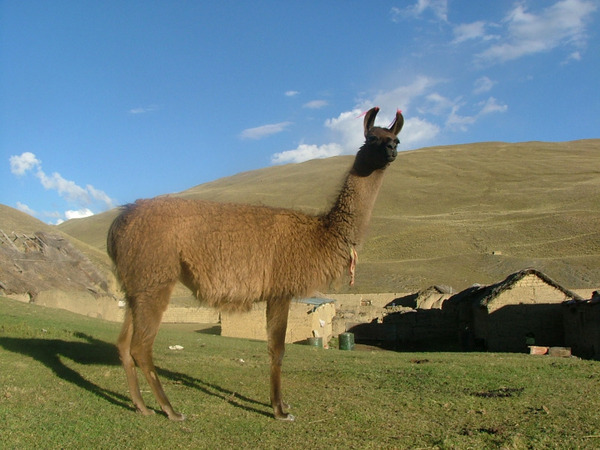 Later in the afternoon we can join the village inhabitants to return the llamas and alpagas to the village for the night. 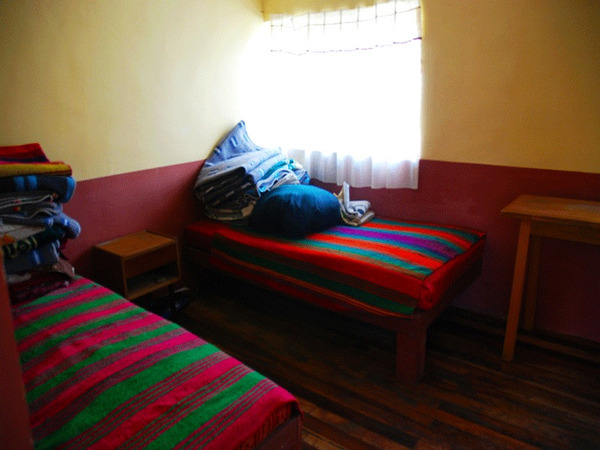 Traditional andean dinner and night at a local host's or at the Eco Lodge (depending of the number of people). 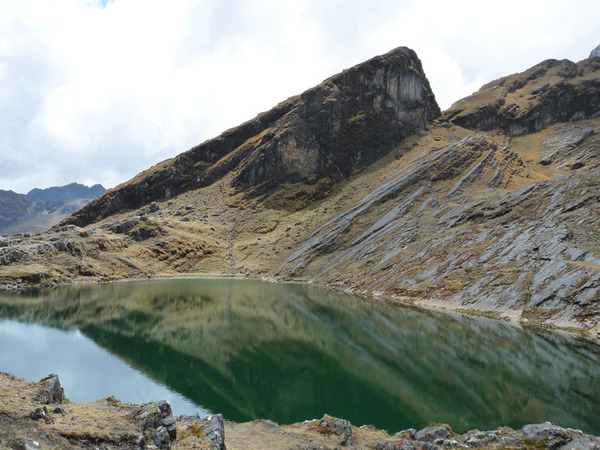 - trout fishing in the lakes at the base of the Condoriri with the local guide. 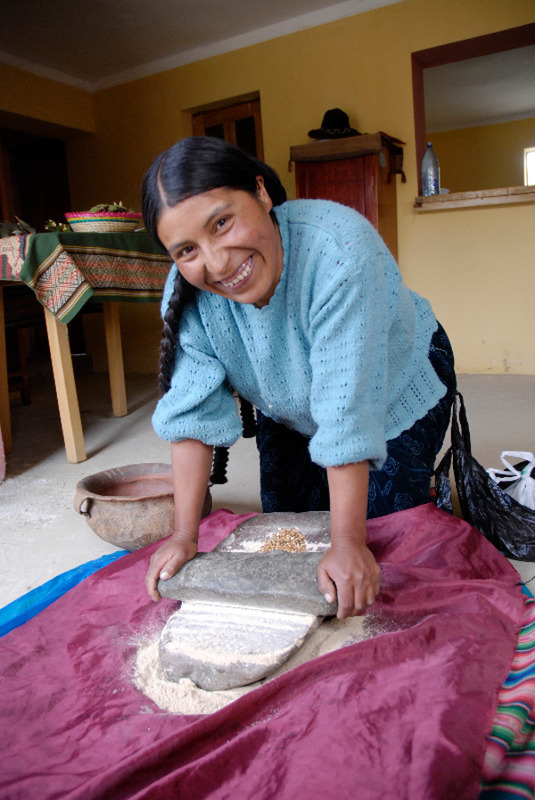 - making of the chuño, a dehydrated potatoe in the ancestral tradition, very appreciated by the Aymaras (june and july). 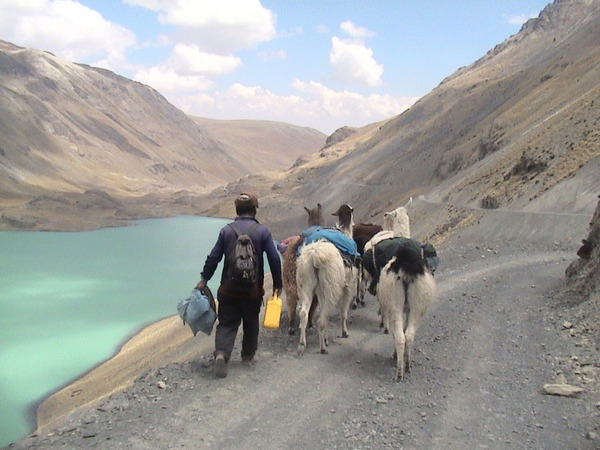 We will return to the village for lunch and participate to the traditional preparation, and leave late in the afternoon to return to La Paz.